Still ranked as one of Rocky Patel's bestselling cigars, the Rocky Patel Vintage Series 1992 line offers a spicier taste than the Vintage 1990. Made exclusively of Ligero leaves, this hand-rolled premium cigar features a zesty 10-year-old Ecuadorian Sumatra wrapper, infused with 7 yr. old Dominican and Nicaraguan fillers and a Nicaraguan binder. The Rocky Patel Vintage 1992 offers a medium to full-bodied smoke with bold, rich, and creamy overtones from start to finish. Stock up your humidors today with these masterpieces! 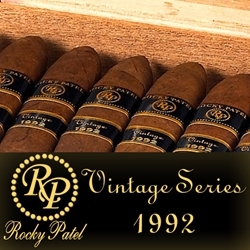 Rocky Patel Vintage 1992 are handmade premium cigars that make an excellent choice for any cigar connoisseur. Smokers Discounts has made it easy and affordable to buy premium cigars online. A variety of sizes and flavors are listed below at our discount online cigar store. Each of these styles are in stock and available. Call us for more details!